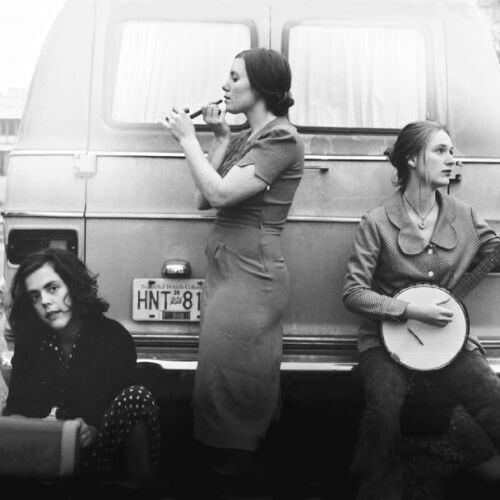 The Be Good Tanyas are an acoustic trio with folk and americana influences, hailing from Vancouver, British Columbia. They play a combination of original and traditional material, and are notable for their lush vocal harmonies. The group features Frazey Ford (guitar, vocals), Samantha Parton (guitar, mandolin, banjo, vocals) and Trish Klein (electric guitar, banjo, harmony vocals). Jolie Holland is a former member and also a frequent guest. The story of the groups begins in early-to-mid ’90s in the Kootenay Mountains outside of British Columbia, where caravans of tree planters toiled each year to replenish the rich Canadian forests that suffer abuse by the lumber industry. Ford and Parton lived the vagabond lifestyle and made a rudimentary living as tree planters during the summer months and doing other odd jobs or traveling during the winters. When they met at a tree planters’ camp, they discovered a mutual love of music, but ultimately went their separate ways. A few years later, Klein and Ford hooked up when both were attending music school in Nelson, British Columbia. For a time, the three of them headed in different directions: Ford went to Montreal and then Guatemala, Klein to Vancouver, and Parton traveled south through America with her dog Sherpa by her side, eventually settling in New Orleans. Chance brought the trio back together in Vancouver in the winter of 1999. By this time, each had been experimenting with many different styles of music – Ford was in a trip hop band in Montreal, Klein and Ford later formed the soul/folk band Saltwater June in Vancouver, and Parton had been touring the back roads of America with spoken word punk poet Chris Chandler as well as her country-duo side project, The Illegitimate Daughters of Johnny Cash. Their luminous debut, ‘Blue Horse was named one of 2002′s Top 50 albums by Britain’s Q Magazine. The albums "Chinatown" followed in 2003 and "Hello Love" in 2006. In 2008 the band took a break from touring and recording. Ford released her debut solo album, "Obadiah", in 2010. The band is scheduled to play the 2011 Winnipeg Folk Festival.